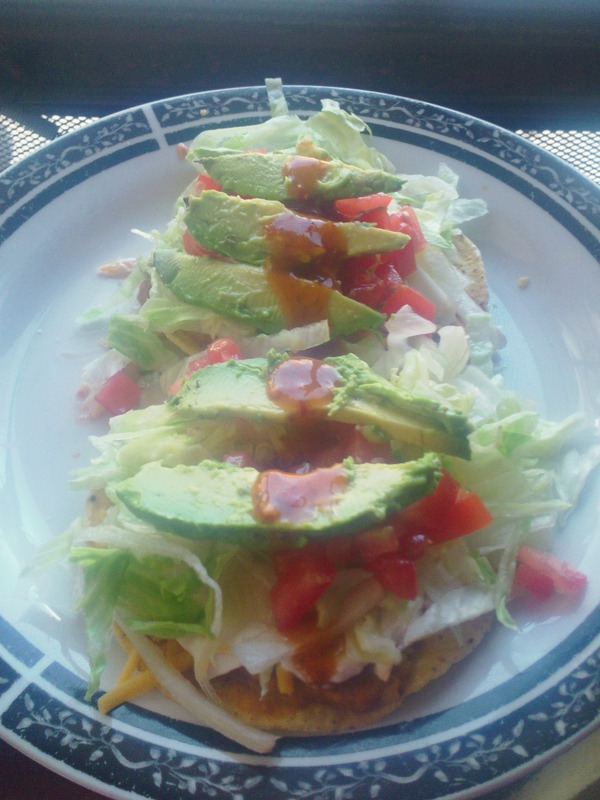 Okay tostadas are a no brainer and need no step-by-step recipe. I mean it’s basically an open faced taco, right? I think the secret to a good tostada is having all your veggie toppings as fresh as possible, homemade salsa and top it off with good Mexican crema. Start off with your tostada shell. Try making your own at home by placing corn tortillas on a hot comal, an open grill or placing them in the oven. Toasting them up to crunchy goodness. Fry up some flour tortillas to a golden crisp. Yummy! I never thought about frying flour tortillas until I read this. Spread some refried beans on the shell. Preferably homemade. Using your own beans is best because you can season them however you want. Also try adding chorizo, it’s the best. Canned beans taste, well, like the can. Not appetizing at all. If you must use canned beans try Bush’s pinto beans. My family has found that they are better than most other canned beans. Season them the way you like and refry them in bacon grease. This just eliminates any other taste that is not very satisfying. Adding meat is good but not necessary. Bean and cheese tostadas are great too. If you must be a carnivore your meat choices are endless. Ground beef or turkey, shredded chicken, ham or even seafood! Sprinkle shredded cheese on top of the beans and meat. Then layer your veggies; shredded lettuce, chopped tomato, slivered onion and avocado slices. What you could do is make a pico de gallo with cubed avocado and throw that right on top of your shredded lettuce. Last but not least, top off your tostada with Mexican crema, your favorite salsa and a squeeze of a lime. Enjoy! I would love to hear how you build your tostadas. I have to pat myself on the back for this one. This was so good I think I ate the entire pan. Melt the butter in a medium skillet over low-medium heat. 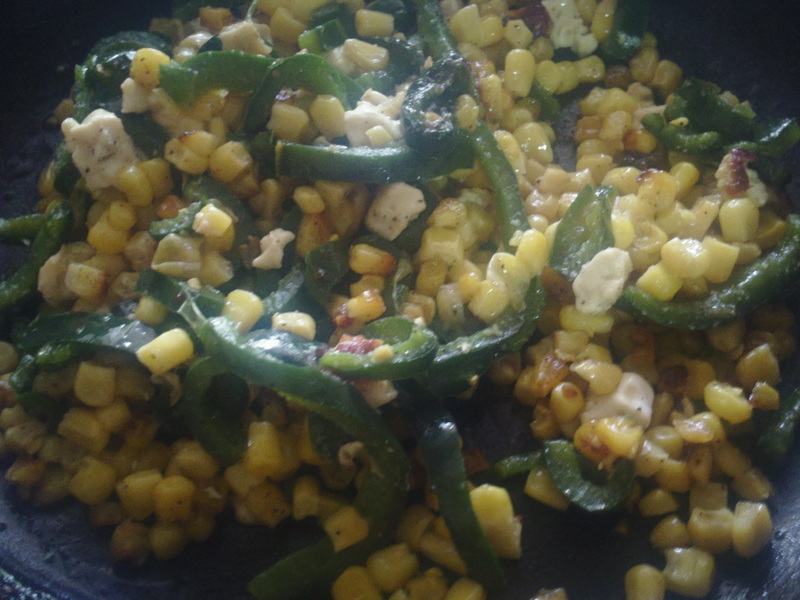 Add corn, rajas, tofu and season with garlic powder, salt and pepper. Mix vegetables, cover skillet and lower heat to low. Cook for 20 minutes or until the corn is nice and toasted, stirring every once in a while. The tofu will also toast a little as well which is extra fabulous! On my very first visit to Mexico I was afraid to eat anything. From what I was told everything is made of cat and dog. So I starved myself on my 3 day visit. My husband’s cousin didn’t make it easy for me to want to eat anything either as he joined in on the awful rumor que apenas llego los gatos en McDonald’s. Nooooooooooooooo! A few years later my husband and I returned to Mexico for one of our wedding anniversary’s. I was a little less naive and my palate was ready to experience a little bit more of what Mexico had to offer. I decided to trust my husband’s cousin and he led us to, what is now my favorite little spot, the Cenaduria Tampico. They have, well in my opinion, the best sincronizadas. What is a sincronizada you ask? 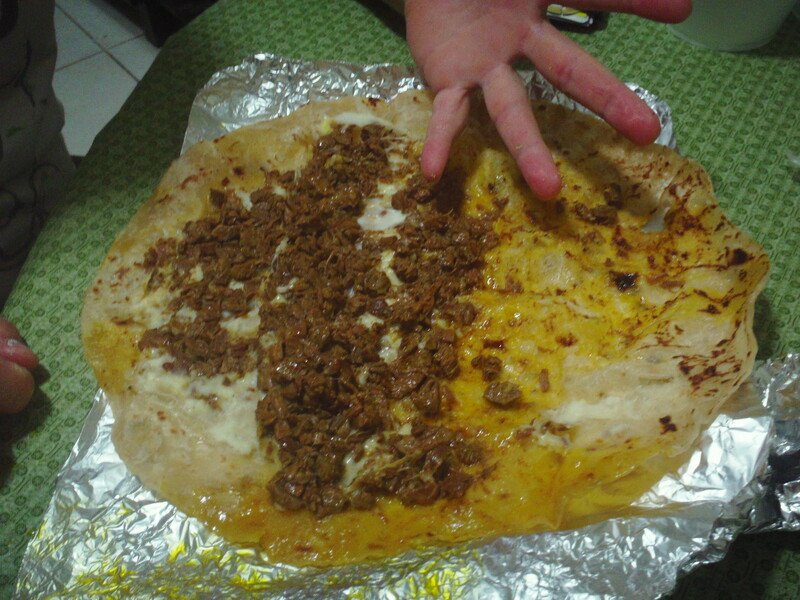 Well, it is only the best over sized tortilla filled with beans, cheese and your choice of carne desebrada (shredded beef), fajita (chopped skirt steak) or trompo (pork sliced off a spindle). True Mexican food is simple yet offers an array of mouth watering flavors. No rice and beans to make you say “Oooh, I over did it.” Simple. An order of small tacos and that’s it. No chips and salsa to make you full before your actual meal is served. Simple. I would always be so anxious to get in my kitchen and recreate these simple little pleasures that never worked out. US store packaged tortillas are no match for the awesomeness of Mexican tortillas. When I take a bite of a warm corn tortilla, I taste…CORN! Imagine that. You will typically find 1 kilo of corn tortillas in the middle of every breakfast, lunch and dinner table. Flour tortillas are just as awesome and are really considered a treat. US store packaged tortillas taste like gum. So needless to say my American made sincro tasted like gum and the inside of a can. A few lessons learned: 1) Always make a pot of homemade beans to have during the week, 2) buy tortillas made fresh daily at your neighborhood tortilleria and 3) If you want a sincro, walk to the nearest corner and order one. What your basically going to do is make a giant taco or quesadilla. Be sure to heat up your tortillas. I only say this because I know people that just eat the tortillas cold straight out of the package. Bleh! What I like to do is heat the tortilla a little. Just enough to make it fold with out breaking. Heat a large skillet over medium heat. 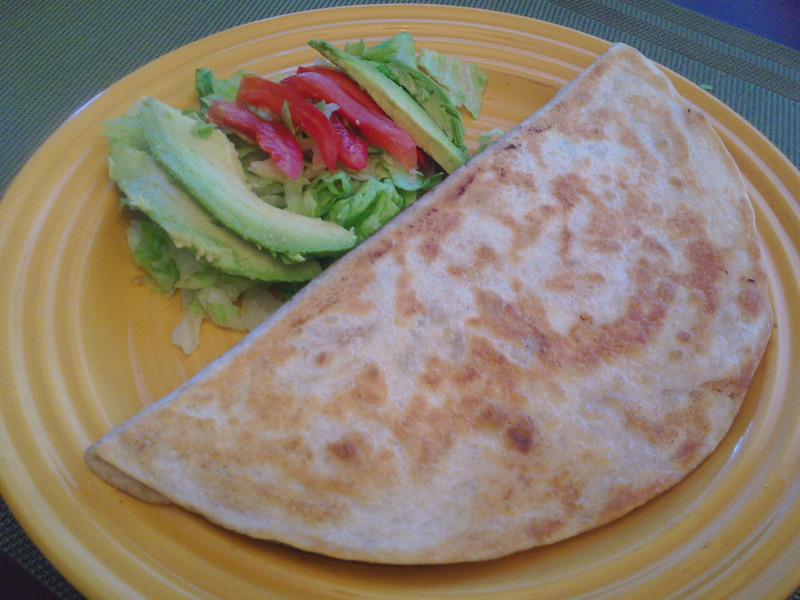 Fill your tortilla with all ingredients and fold to resemble a giant taco. Spread butter on one side of the tortilla and place, buttered sided down into the skillet. Grill until golden brown on both sides. Serve with lettuce, tomato, avocado, mexican crema and salsa if desired. Place a large pan filled with water on top of a regular pot and voila! Instant pressure cooker. My grandpa ran into an old friend of his son’s a while back and the old friend remembered one thing about my grandparent’s house…grandma’s beans. I have to tell you, and this is no lie, my grandmother makes the best beans in the entire world. I still have not found out her secret because she has explained to me how she makes them and I have tried, and tried, and tried her way and they never come out like hers. Her beans have this super creamy gravy to them and the taste is like butter. My goodness I may need to make another trip back home. Okay enough slobbering over here. Let’s get to it. Start by picking out any rocks and ugly looking beans. Place the cleaned out pintos in a colander. 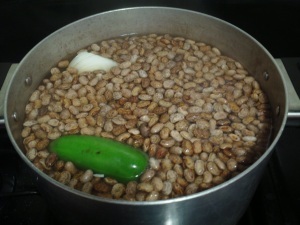 Rinse and cover the beans with water and let them soak 2 hours or over night. This is a method of cleaning the beans and shortening your cooking time. 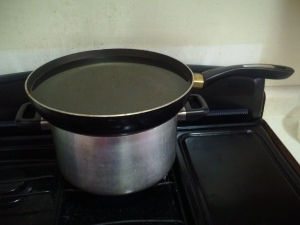 While your beans are soaking bring to a boil about 2 qrts of water in a large stock pot over medium-high heat. Once the water has come to a boil add your beans, onion, garlic cloves and jalapeño. Adding the jalapeño will not make your beans spicy unless it burst and the seeds come out then we have a problem. You can always remove the chile if you see it starting to burst open. Cover and lower heat to medium. Cook for about 2 hour or until beans are tender. You will need to add water through the cooking process as it evaporates. Which is why you do not add your salt and pepper or any other seasonings until the last 30 minutes of cook time. Keep them in the fridge up to 3 or 4 days or you can freeze them up to a month or month in a half. I usually freeze half. Bust out your blenders! I am making juice! I am working on a series of juices and smoothies. So far I have made orange pear juice and a mango banana smoothie. I am still working on perfecting these two but please look under the Drinks tab at the top of the page for up coming drink recipes. Here is a small tip for sharpening you blades. Throw some ice in the blender and crush away. This same tip applies to your garbage disposals as well. Last year Esposo and I went on an all natural diet for a few weeks and his tia invited everyone over for flautas. We didn’t expect to eat because we were not eating meat at the time. 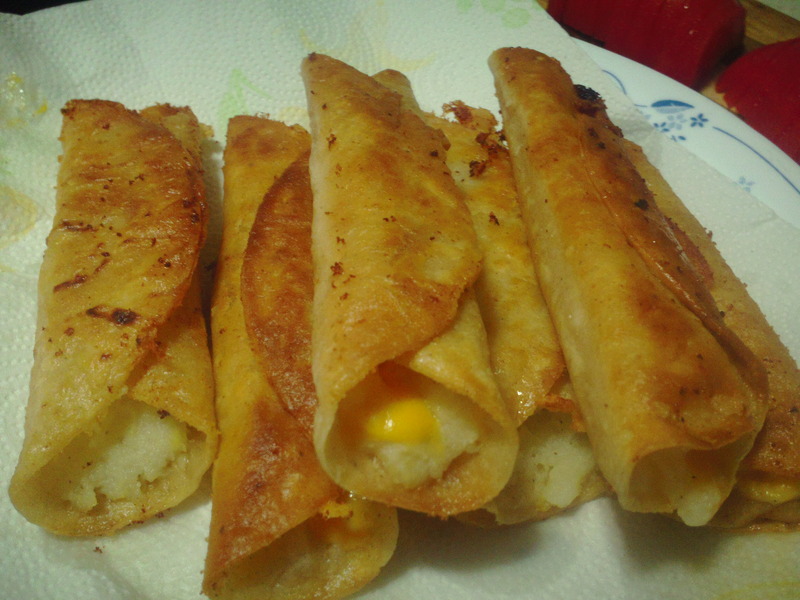 To our surprise she made flautas with mashed potatoes. She is always so considerate of us and others as well. She wants to make sure everyone is comfortable and happy. I remembered these flautas when I went all natural again a few months back and my goodness did I do a good job with these. The cheese you see here is NOT cheese at all. It’s cheddar flavored rice shreds. Heat the oil in a skillet over medium-low heat. Make an assembly line with your corn tortillas, mashed potatoes and cheese. 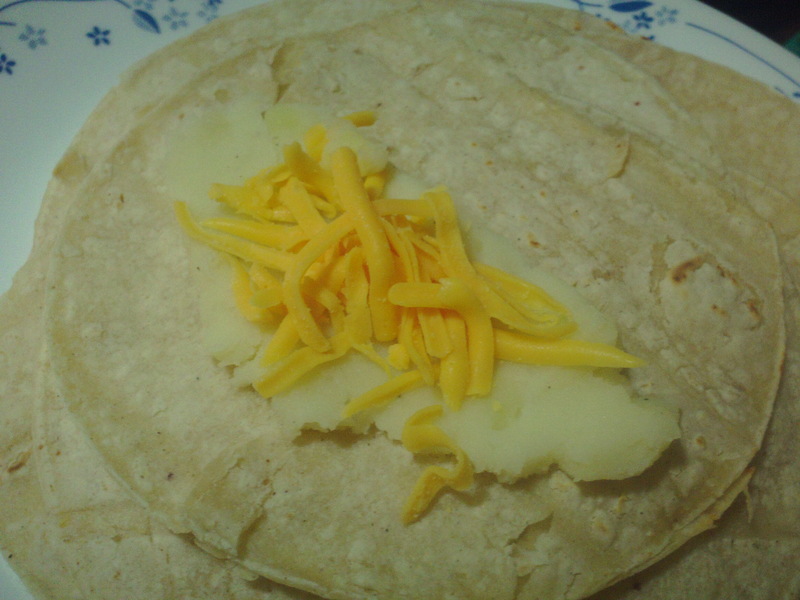 Place about a tablespoon of potatoes on the center of the tortilla and spread toward the edges leaving a little space and then top with cheese. Roll up into a taquito. The tortillas will fold easy if you heat them up just a little not too much. If you try to fold them unheated they will break. Place them seem side down in the heated oil and fry them until the taquito is golden brown on both sides. Place them on a platter lined with paper towel to drain off excess grease. You could use refried beans in place of the potatoes as well. Serve with a simple salad, a side of guacamole, sour cream and salsa. I highly recommend you try this recipe the all natural way by substituting your dairy with vegan products. You can find rice shreds and soy milk at your local grocery store. Let me know if you try this recipe and tell me what you think. After four years of being with out a job, I am re-entering the workforce. Whoo hoo! A few weeks back I had several meetings with my soon to be employer and the moment I was told my start date I screamed with excitement. On the inside of course. I was excited about my start date because it gave me the chance to go back home and visit with my family. I had such a great time. Okay so back to the recipes. Like limemade, grapefruit juice is just as refreshing. I might have drank the whole pitcher in the matter of minutes. Is that bad? 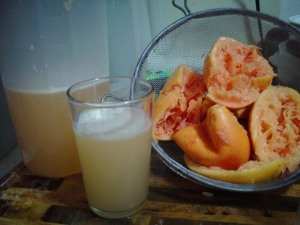 My MIL kind of freaked out when I told her I made grapefruit juice. She told me not to drink to much of it. Ooops! I pretty much followed the same process as to make the limemade but instead of limes I used grapefruit. Squeeze the juice of the grapefruit in to a 2 qrt. pitcher. I used the back of a small cup to help press as much juice as I could from the grapefruit. I really need a juicer. Add 1 qrt. of water and sugar. Stir well adding water until you reach your desired taste. Pour into a glass with ice and enjoy. What are your favorite fruit juices you like to make at home?